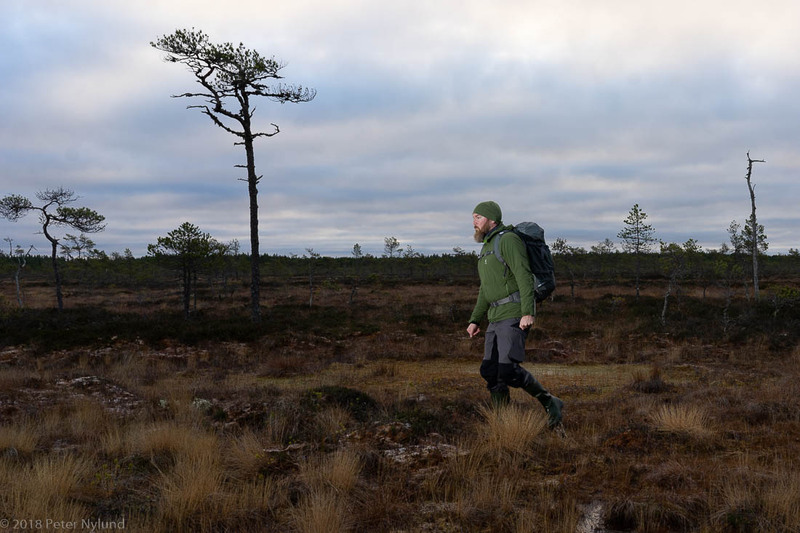 I've been quite satisfied with the Lowepro Photo Sport 200 AW, which I've used for six years now. The volume is a bit limited, probably around 15 liters or so, but quite perfect for ordinary mountain bike rides when you want to bring a camera with one or two lenses, in addition to some stuff like spare clothes or coffee gear. 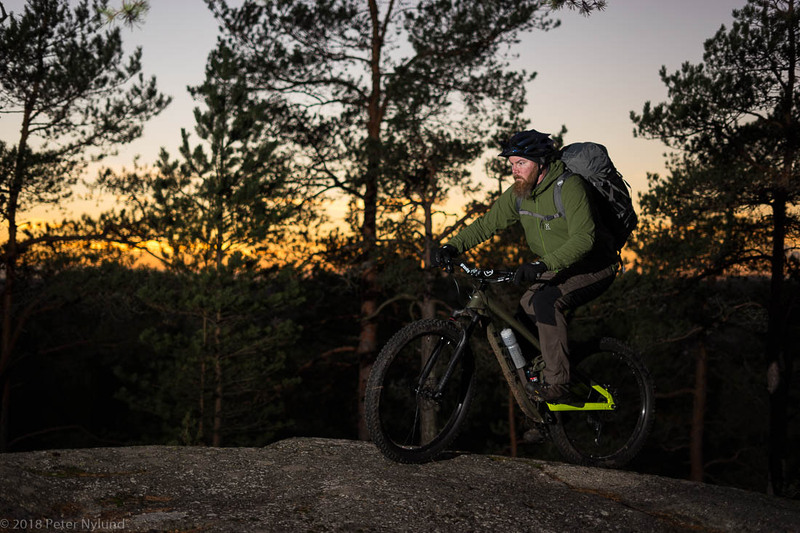 It is also small enough to be excellent for mountain biking, but can also be used in other activities. The back length is too short for me, but it doesn't matter much with a pack this small. I'm going to do a bit more photography the next few years, and need to be able to bring more camera gear while still being to ride technical terrain and started to look for a pack in the 35-40 l range. I though this would be easy, since e.g. Lowepro has umpteen different models. A visit to a local shop revealed that this would not be easy. The LowePro packs have a one size fits all sized back length, which means that the size fits some people and definitely not me. Thus LowePro was out of the game. 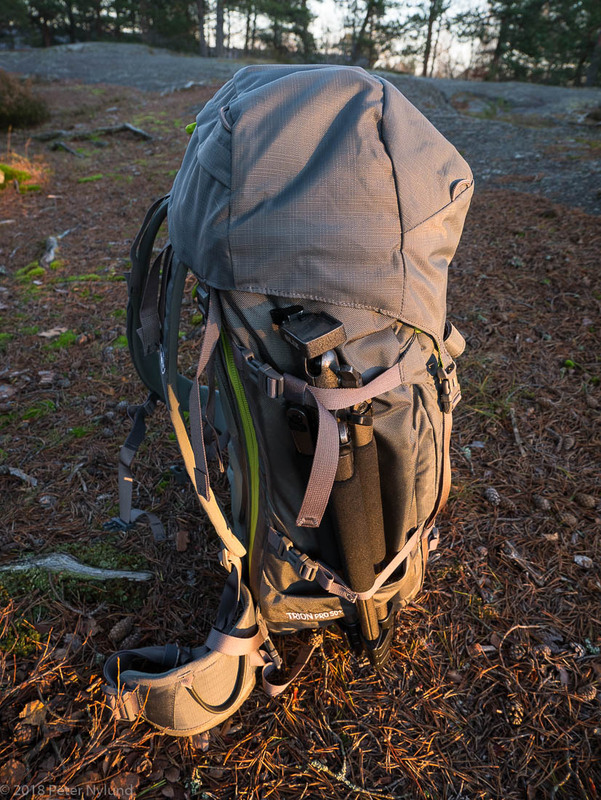 I think a bigger pack needs to fit better, since you'll be hauling more gear and weight with a bigger pack. A quick googling led me to F-Stop backpacks. That didn't last long, since while F-Stop has some really interesting models they are also much too short, due to the one size fits some back length. Mindshift had some packs with adjustable back length, but not the interesting models. 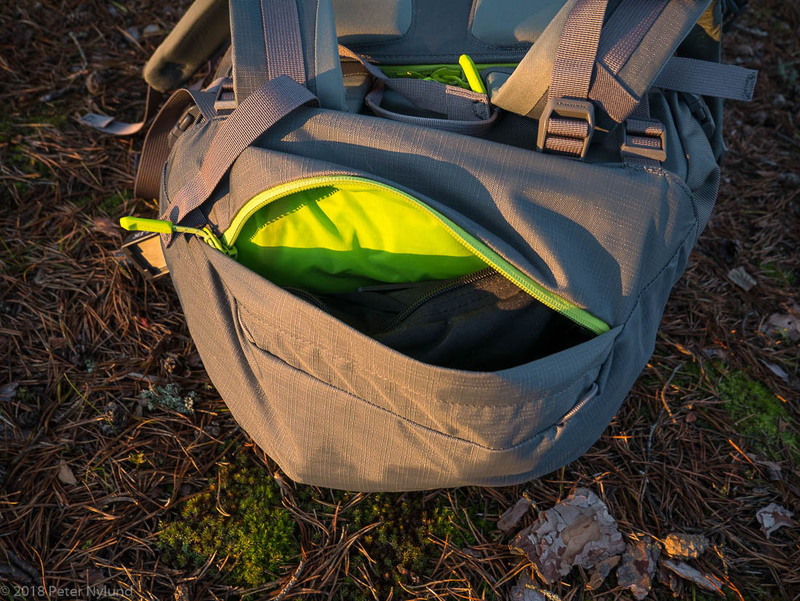 35 l or larger size. Access through the rear panel. Access from the side, which is a quick way to get a camera without taking off the pack completely. Doesn't seem to be an option on bigger packs, though. Space for a middle-sized camera kit, with additional space for other items such as spare clothes, food and a thermos bottle etc. 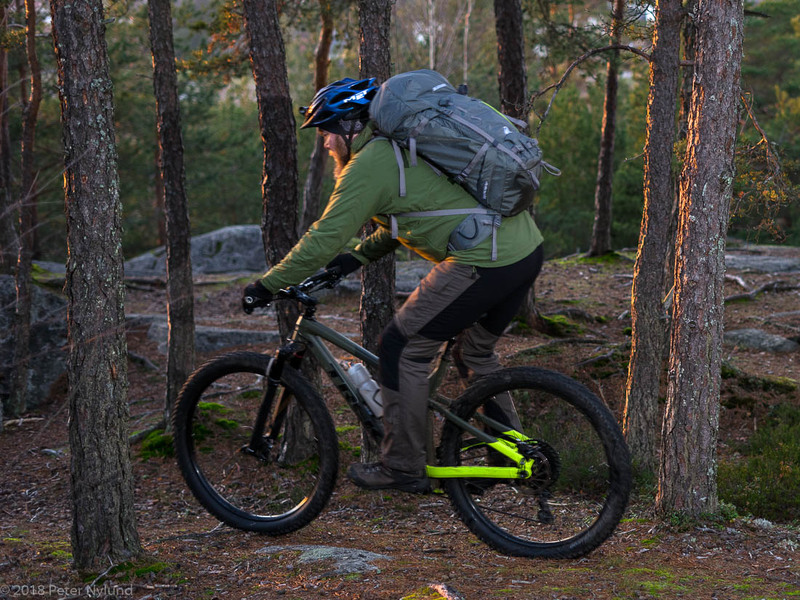 A slim form factor, to keep the weight close when mountain biking. 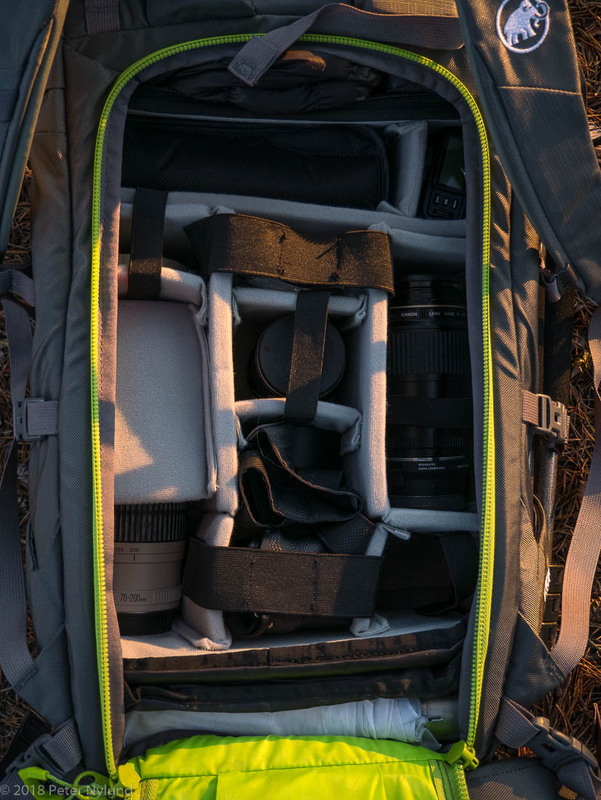 Most camera backpacks are quite boxy. Suitable for my L sized torso length. The candidates where rather few with these requirements. 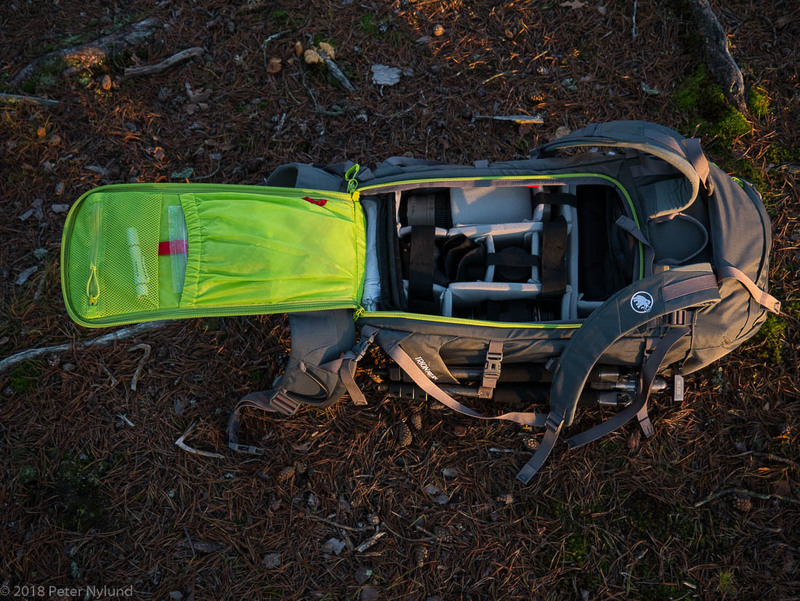 A very interesting alternative was the Shimoda Explore 40, which should be an excellent camera backpack. It wasn't available locally or even from Finland, and I wasn't prepared to buy the rather expensive backpack unseen, though, so I didn't buy it. 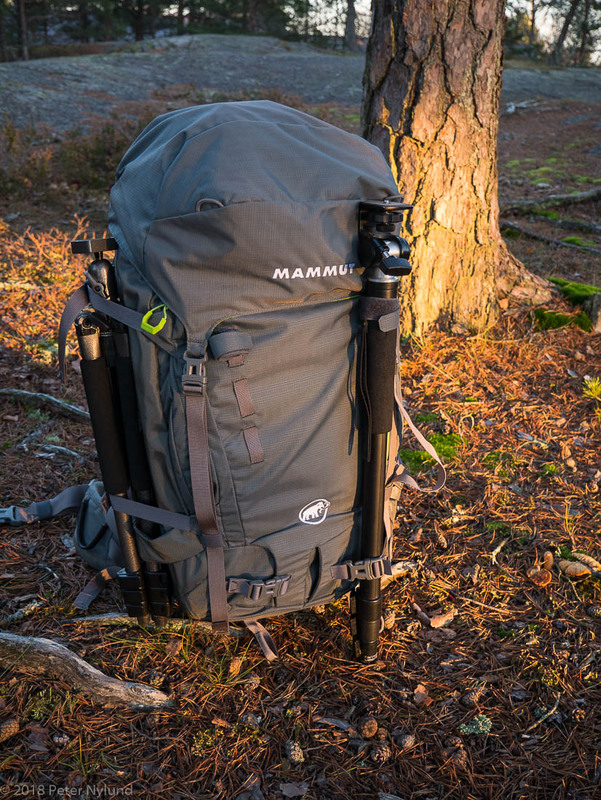 The Google searches led me to a few posts at the DPReview forums, which talked about using a standard backpack with a camera insert, specifically the Mammut Trion Pro 50 + 7 l alpine backback with the F-Stop Large Slope ICU (Internal Camera Unit). The specified torso length for the backpack was slightly smaller that my own torso length, but based on the DPReview discussions it seemed possible, and thus I ordered one from a Finnish net shop, since it wasn't available locally. It turned out to be a great solution. The rear opening is great and a must in snow conditions. It means that the part that comes in touch with your back is not wet, snowy or dirty. The F-Stop Large Slope ICU is a perfect fit. Tight to get through the top opening, but it stays in place. It is roomy enough for my purpose. In the picture it is loaded with a small fullframe mirrorless camera with a 50/1.8 lens, a 70-200/4 lens, a 28/2 lens, a 100 mm macro lens and a wireless flash system as well as some other small stuff. There is still room to spare. I do strive to use ligth gear but e.g a 100 macro lens just is unproportionally heavy in my opinion. The panel that opens up has two pockets on the inside, so there is space for organizing miscellaneous items. Under the ICE there is some extra space for stuff, in this case rain clothes and an umbrella. The lid has a few liters of storage space and there is a mesh pocket on the underside of it. There is still room for clothes and other gear in the top part of the backpack. The lid can be lifted up for extra space under it, but then the backpack becomes too high for mountain biking and hits the helmet. For other activities it is usable if more storage is needed. 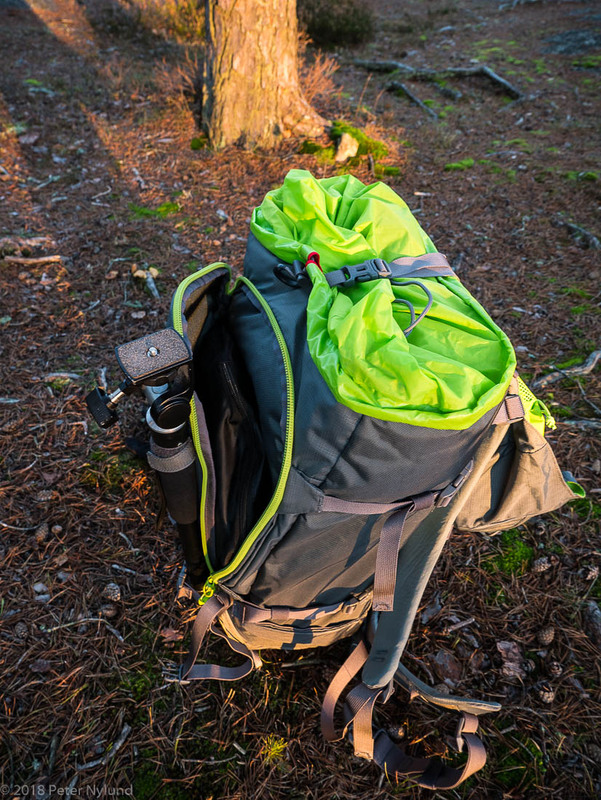 An alpine pack does of course have extra attachment points, and getting tripods attached is no problem. The only thing missing is stretch pockets on the side for water bottles. I'll have to figure something out for that. 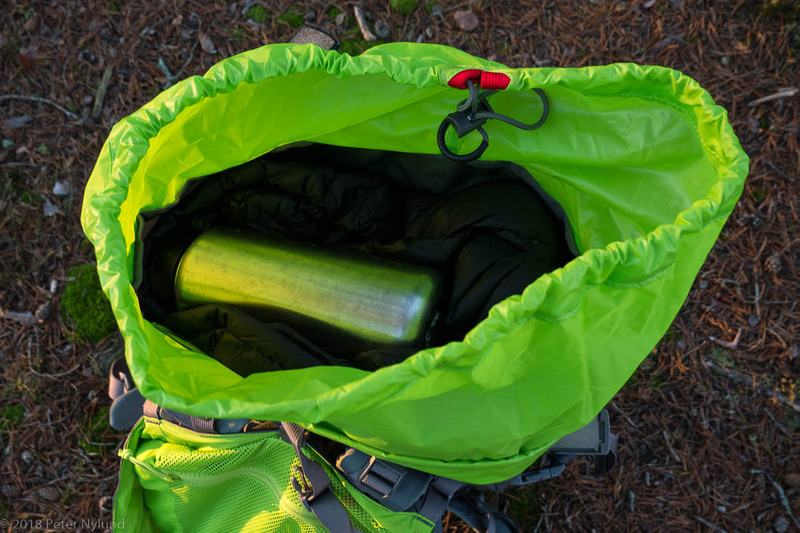 There is a fairly big front pocket, that can take clothes, reflectors or whatever one needs. 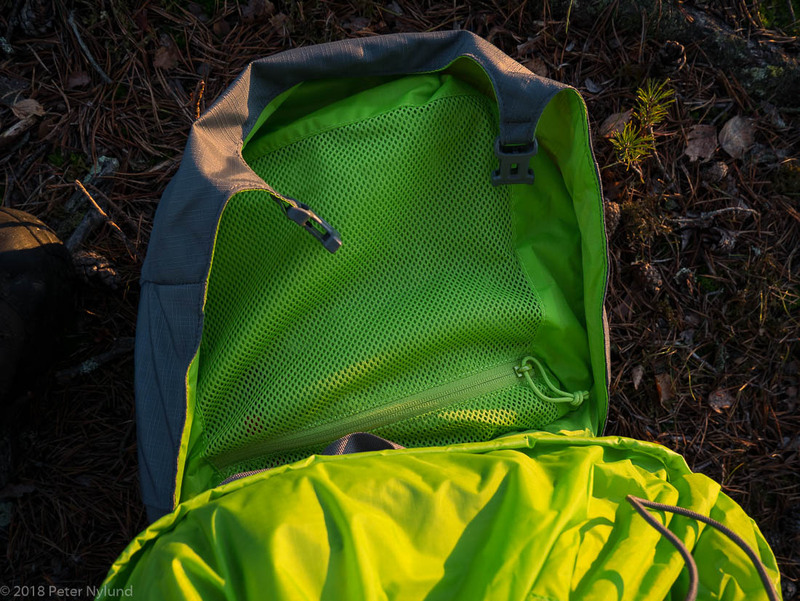 The backpack turned out to be comfortable when hiking with a moderate load, but that doesn't translate directly to mountain biking. It turned out to be quite good. Any longer and it would be too long and hit the helmet. Also, when riding the weight must be kept reasonable, in order not to affect the balance too much. The backpack itself is fairly light, but the ICU weighs a bit. The total weight of 2.5 kg is still not much for a camera backpack. All in all, a good solution if you are too tall for regular camera backpacks. It is also a bit cheaper that dedicated camera backpacks. If you are say 170 cm - 180 cm the regular manufacturers should have lots of options to offer, though.